Sometimes a garden is something more than the carefully plotted plants for the outdoor space, the cohesive plan, the coordinated palate. Sometimes, it’s the whimsical that makes the garden. 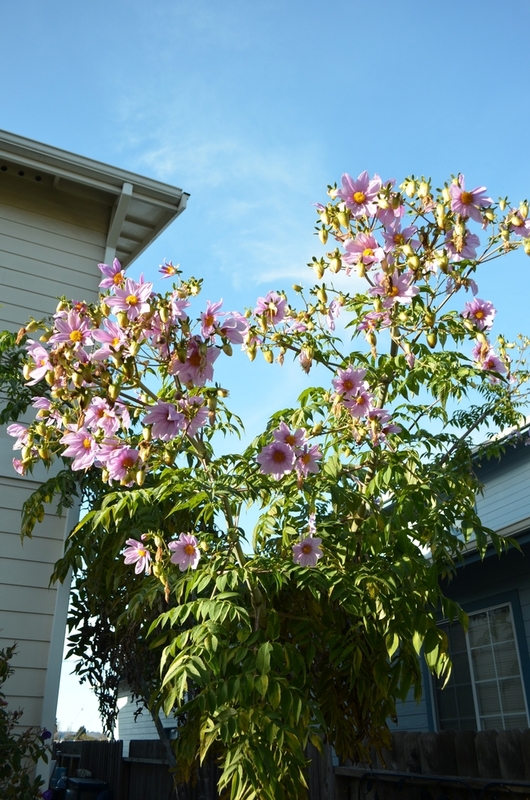 For me, it’s the tree dahlia (Dahlia imperialis) that amuses me in the late fall and early winter months. I planted it in the wrong place entirely, but can’t bear to move or replace it. 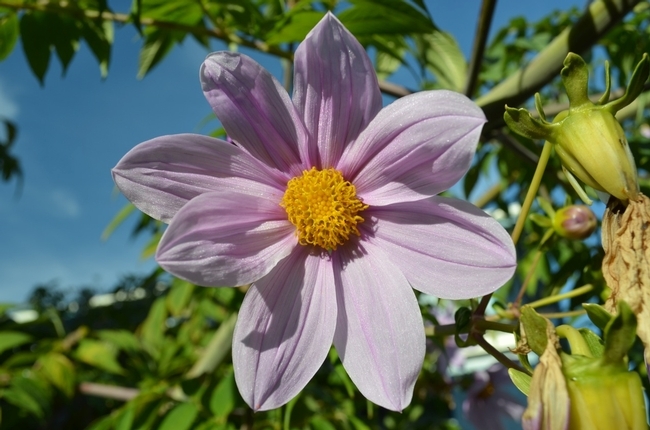 The tree dahlia is native to Central America, but it seems to survive, and even thrive, in our mild-winter region. The tree dahlia is a multi-stemmed plant, growing to 10-20 feet tall (actually, I’ve never seen one as “short” as only 10-feet tall) on bamboo-like, hollow, stems that are about 3-4 inches thick. It has daisy-like 4-6-inch wide lavender flowers with yellow-orange centers blooming at the end of the branches in late fall. I count on it blooming sometime between Thanksgiving and Christmas. Although it is frost sensitive, in my experience, it is the early winter windstorms that take the real toll on the plant. If we get a Thanksgiving windstorm, I’m likely to lose my tree dahlia before getting to see it bloom. It’s such a shame seeing the stems reach their 20-foot height and getting knocked down before they bloom! After blooming, the tree dahlia dies back in mid-spring (around March). The Sunset Western Garden Book says that this annual dieback “relegates [the tree dahlia] to tall novelty class” instead of a “valued landscape plant.” The stems can be cut back and the plant will sprout again to put on its show in the late fall. Sections of stem with 2-3 nodes can be used to start new plants. While most gardeners will tell you to plant the sections in sand or soil to start the cuttings, I’ve left them piled up in a sideyard and they will begin to sprout without any care. The fast-growing new plants should be placed in full or partial sun, in a wind-protected area. Years ago, I planted my tree dahlia in a shady, windy, narrow sideyard, naively thinking that the plant would get no bigger than one of those 4-inch stems. Today, it has several multi-stemmed trunks of at least 12-inch in diameter. It sprouts a fringe of sideyard-blocking leaves seemingly daily in the summer, making me feel like an intrepid explorer as I hack my way through. And then, if I forget to look up—20 feet up!—in late fall, I may miss the lavender bursts of flowers completely. It is in the wrong place entirely. But each year, at some point, I happen to look up high, catching a glimpse of this “tall novelty” in full bloom, and I can’t help but to be amused knowing that Thanksgiving is near and that spring has arrived near the roof of my house.